Robert Frost? Edna St. Vincent Millay? Apocryphal? Dear Quote Investigator: The acclaimed American poet Robert Frost was asked as an octogenarian what he had learned about life, and he succinctly replied: It goes on. I have been unable to find a contemporaneous citation, and a popular quotation website says that the attribution is disputed. What do you think? He paused a moment, then with the twinkle sparkling under those brambly eyebrows he replied: “In three words, I can sum up everything I’ve learned about life. It goes on. In all the confusions of today, with all our troubles . . . with politicians and people slinging the word fear around, all of us become discouraged . . . tempted to say this is the end, the finish. But life — it goes on. It always has. It always will. Don’t forget that. Edna St. Vincent Millay? Apocryphal? It’s one damn thing over and over. It’s the same thing over and over again. It’s the same damn thing over and over. Would you please examine this saying? It’s not true that life is one damn thing after another—it’s one damn thing over & over—there’s the rub—first you get sick—then you get sicker—then you get not quite so sick—then you get hardly sick at all—then you get a little sicker . . . Although the letter was written in 1930 it was only released to the general public in 1952 with the publication of “Letters of Edna St. Vincent Millay” edited by Allan Ross Macdougall. Did Millay, the Pulitzer Prize-winning poet, write this in an essay or letter? Did she say it as an impromptu remark? I have not been able to find a precise reference. Quote Investigator: These two statements can be traced back to a letter that Edna St. Vincent Millay wrote to her mother, Cora B. Millay, in 1927. However, the second statement has been modified in an interesting way. Kathleen is about to publish a book, as thousands have done before her. A person who publishes a book wilfully appears before the populace with his pants down. And there’s nothing you can do about that. Kathleen is not a baby. She is a grown-up person quite able to take care of herself. And she has been struggling for years to be allowed to manage her own affairs. If she knew the kind of letter you wrote me in her behalf, she’d froth at the mouth & spit brimstone. So the second sentence in the widely distributed quotation has been modified. The word “harm” has been changed to “hurt”. Also, the pronoun “her” has been replaced by “him” in two places. 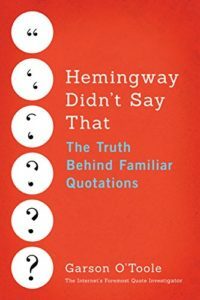 Summarizing, the quotation was written by one female writer about another female writer, but the most common version in circulation uses the words “his” and “him”.